Bosnia and Herzegovina is a European country located on the Balkan peninsula. It was formerly part of Yugoslavia but gained independence in 1992. It's probably one of the less tourist popular countries in Europe, but still worth visit. During my short trip to Balkans I visited the capital and Mostar. Sarajevo is one of the most historically interesting and varied cities in Europe. It is a place where the Western & Eastern Roman Empire split; where the people of the Roman Catholic west, Eastern Orthodox east and the Ottoman south, met, lived and warred. It has been both an example of historical turbulence and the clash of civilizations, as well as a beacon of hope for peace and tolerance through multi-cultural integration. Sarajevo is not a huge city - 395,133 people live in its urban area, but it is very livable, vibrant and busy. The city is historically famous for its traditional religious diversity, with adherents of Islam, Orthodoxy, Catholicism and Judaism coexisting there for centuries. 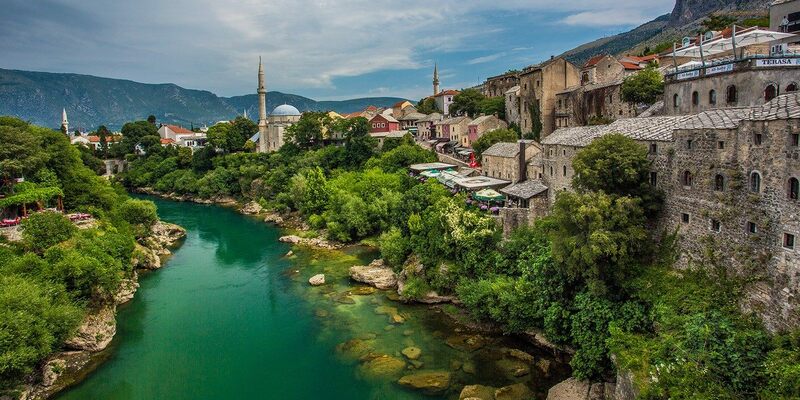 Mostar is a city in Bosnia and Herzegovina, formerly one of the most ethnically diverse cities in the country, and today suffering geographical division of ethnic groups. The city was the most heavily bombed of any Bosnian city during the war in Bosnia and Herzegovina following the breakup of Yugoslavia. At the beginning of the war, air strikes destroyed many important buildings and structures, including the cultural and spiritual icon: The Old Bridge (Stari Most). The Old Bridge Mostar Bridge Mostar has been most famous for this beautiful historic Ottoman-style bridge, which spanned the Neretva river in what is considered the historic center of the city. Through combined efforts with the international community, rebuilding of The Old Bridge was completed in 2004, almost 11 years after its destruction, using some of its original pieces recovered from the Neretva river. A significant portion of the city has been rebuilt and visitors might be surprised to see that this formerly war-torn city is a lively and beautiful destination once again, particularly the area within and around the old town. However, many visible signs of Mostar's troubled recent history remain.